Few days ago, I told the world I was “in ferie” (summer holiday), however the reality of August being almost over, made me realize that I had things to share that could just not wait. This means that you will be reading a little more of me before the month is over . . . I hope this is good news! 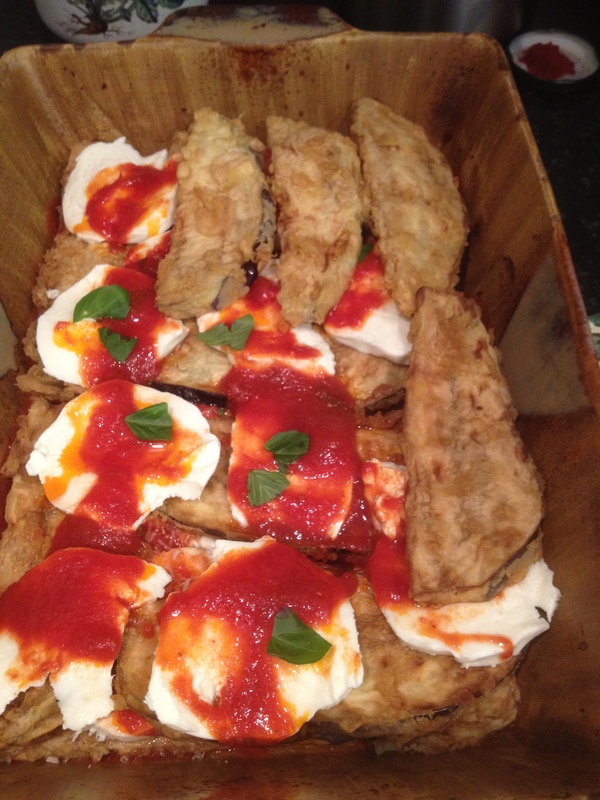 Truly, there is not better time than August to share the recipe of the “Parmigiana di melanzane”. Eggplants, indeed, are at their best in August and the Parmigiana is the symbol per antonomasia (par excellence) of Ferragosto – no Italian Holidays’ history lesson today, I will save it for next year! 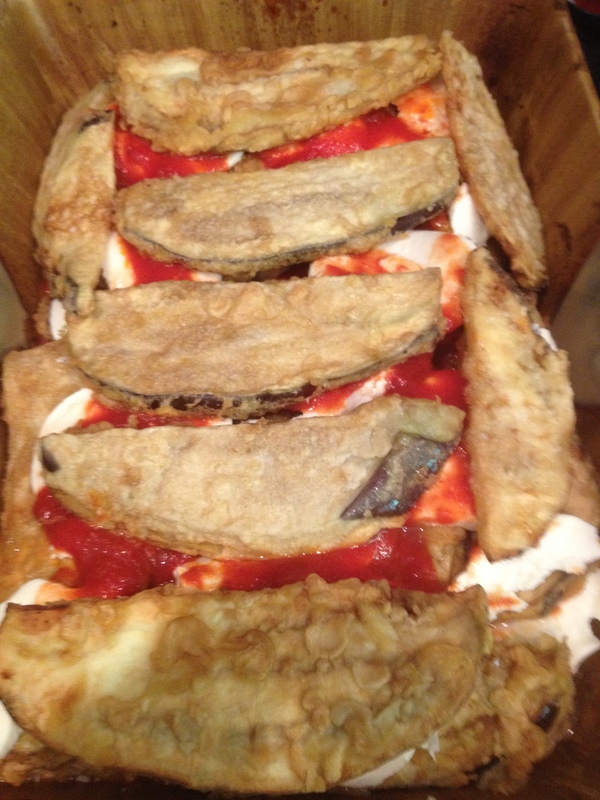 As for many Italian dishes there are several variations of the Parmigiana; some fry the eggplants without dredging in the eggs; some, hoping in a less caloric recipe, bake the eggplants rather than frying them; others, completely ignoring the calories, fry the eggplants twice: two slices of previously fried eggplants are assembled like a sandwich with the mozzarella in between and then fried again. 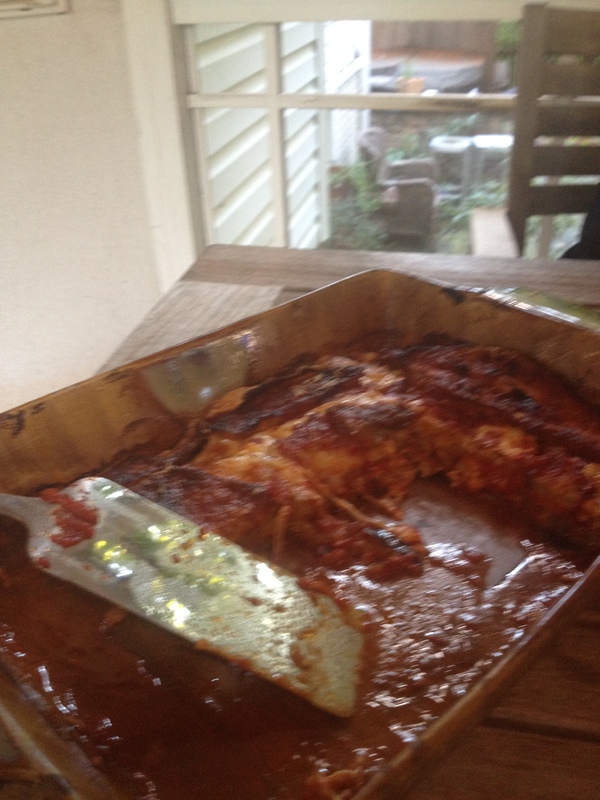 The Parmigiana was probably one of my mom’s specialties – for sure my husband’s favorite – she visited in USA twice and both times she baked her Parmigiana for our American friends . . . they still rave about. So guess what? I use my mom’s recipe – I know you have heard that before. My mom, for special occasions, used the ragù sauce – recipe here – to dress the Parmigiana, however, the dish is just as delicious using a simple salsa di pomodoro (tomatoes sauce). The use of the ragù would add 4-5 hours to the recipe making it a lot less appealing. Even without using the ragù, this dish is not for you if you are pressed for time. Please don’t give up, plan in advance and I promise, that after your first bite, you will not regret the time spent in the kitchen. The Parmigiana di melanzane has always been the dish of the convivial table, friends and family sharing earthy food, warm bread and good wine. It reminds me of the tavolate estive (summer gathering at the table) in my sister-in-law-garden, under the shade of the wisteria and surrounded by the vineyards whose grapes, would soon be ready for harvest. 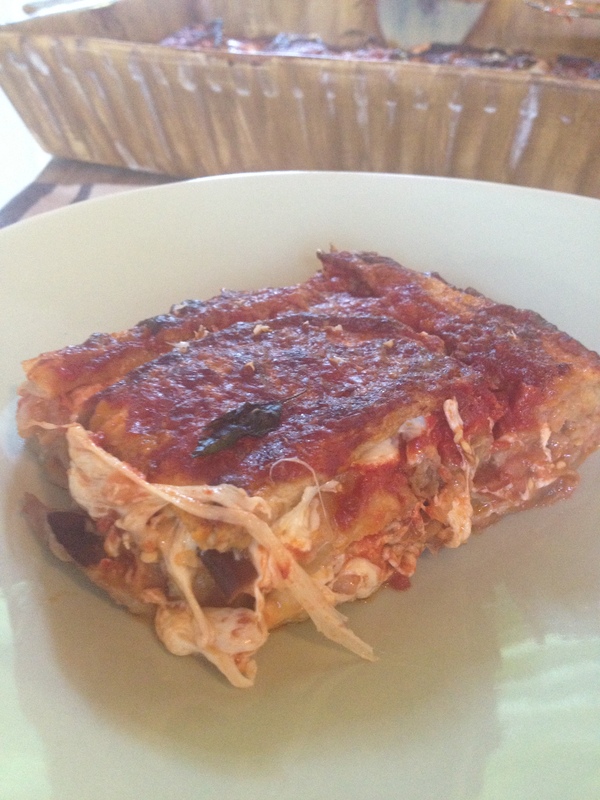 When two nights ago, I decided to finally jot down the recipe, I realized that my pictures from the Parmigiana di melanzane’s file were all lost during my iPhoto crash . . . Have you read my previous post? While this realization was for me cause of despair, it was, on the contrary, cause of immense joy for my husband, who immediately realized that I would make Parmigiana for last night dinner! He was right; I could not post my recipe without my pretty step-by-step pictures. Wash the eggplants and dry. 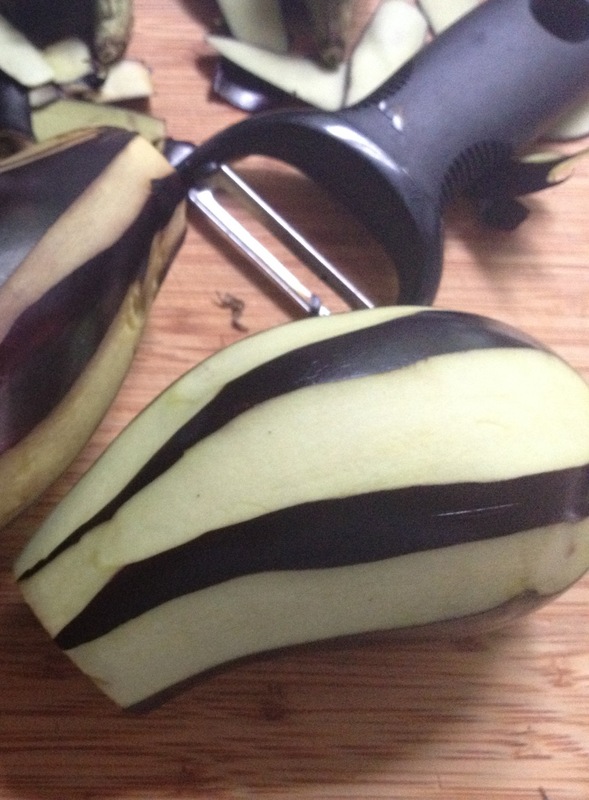 With a vegetable peeler, peel the eggplants leaving one unpeeled strip between peeling. Obviously, this morning I found neither Italian eggplants nor baby eggplants. 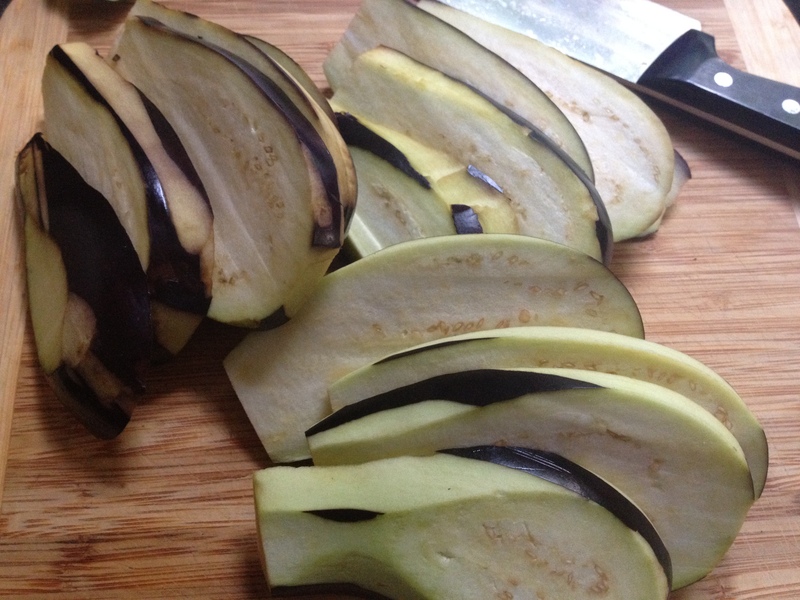 Slice the eggplants lengthwise into ¼ inch thick slices. Layer the slices in a colander, sprinkle with salt, put something heavy on top and let them release their bitter juice for 1 hour minimum, if using Italian or baby eggplants and up to 2 hours if using larger sizes (beware of the many recipes that suggest to let the eggplants to drain for only 20 -30 minute, it is not enough). Look at the bitter juice! 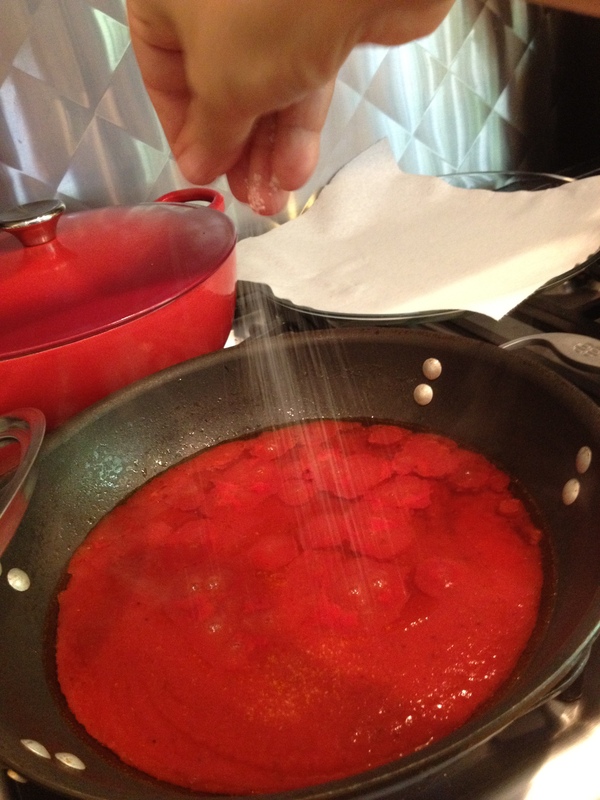 Meanwhile prepare the tomato sauce: in a saucepan heat the oil then add the onion and cook until translucent (my mom, from time to time, would let the onion cook until it was brown and almost crunchy – not burned – she would then spoon it off the oil. Hard to believe, these crunchy fried thin slices of onions are actually delicious on a little piece of bread!). Pour the tomato purée, bring to boil, add salt, and few leaves of basil – hand chopped, no such thing as chiffonade in my house. Stir, lower the heat, cover and let cook for twenty minutes or until thickened. Preheat oven at 400 degree. Rinse the eggplants and pat dry. In a wide, shallow bowl slightly beat the eggs with a little salt. Also, prepare a tray with flour. In a skillet, heat ½ cup of oil. Also, have a tray, lined with paper towel, ready. Dredge each slice of eggplant in the flour first then in the eggs. 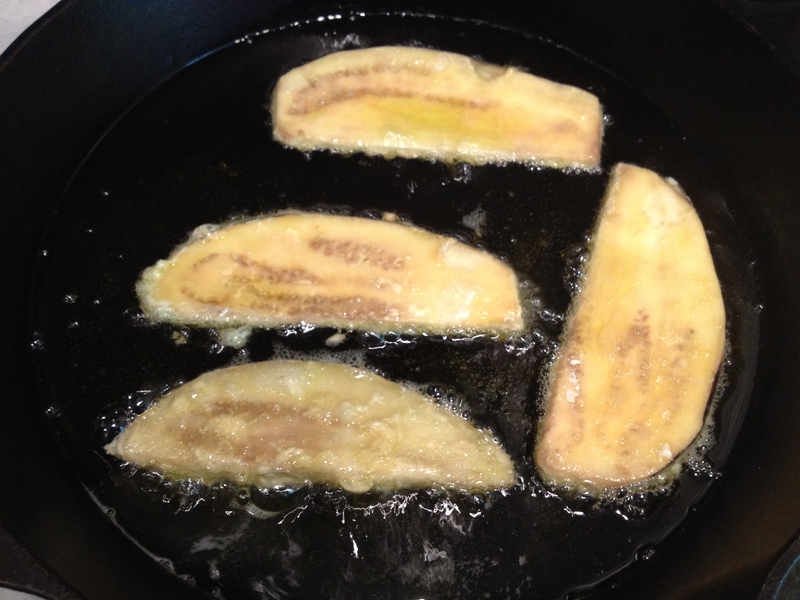 Immediately fry the eggplants in the hot oil until golden on both sides. Spoon them out and let them drain on the paper towel. TIP: If you have a young man like my son, keep him out of the kitchen; my son kept stealing the fried eggplants every time I would turn around. Result? I ended up with few slices short for my last layer. 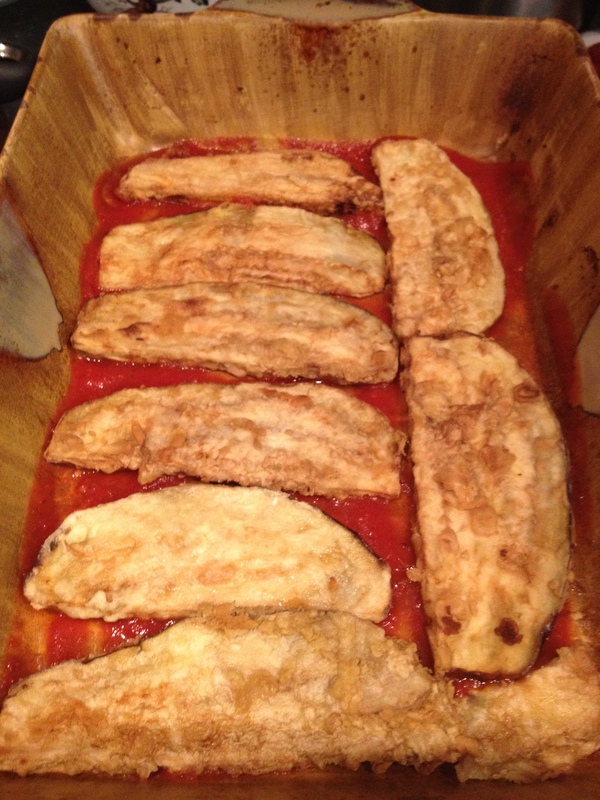 Time to assemble: Cover the bottom of a baking pan with a little tomato sauce then cover with one layer of eggplants. 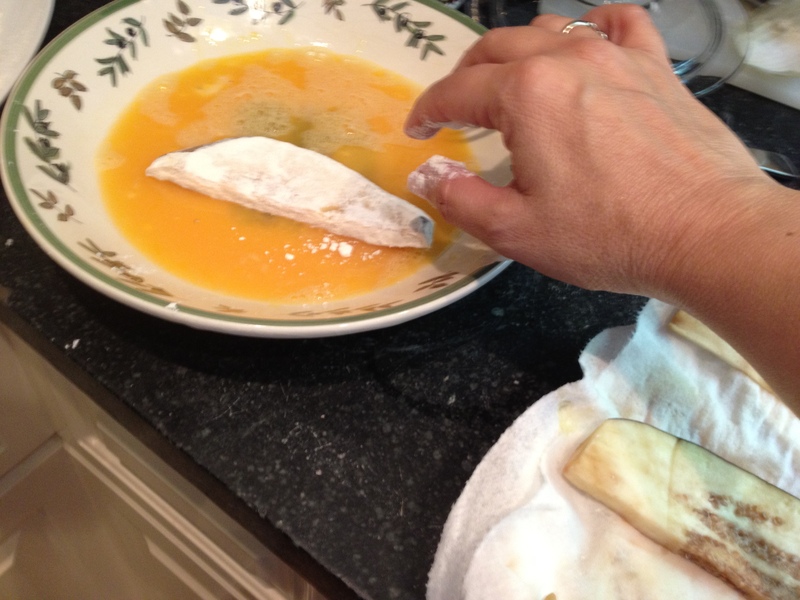 Cover with the mozzarella, then a thin layer of tomato sauce and sprinkle with grated Parmigiano cheese. 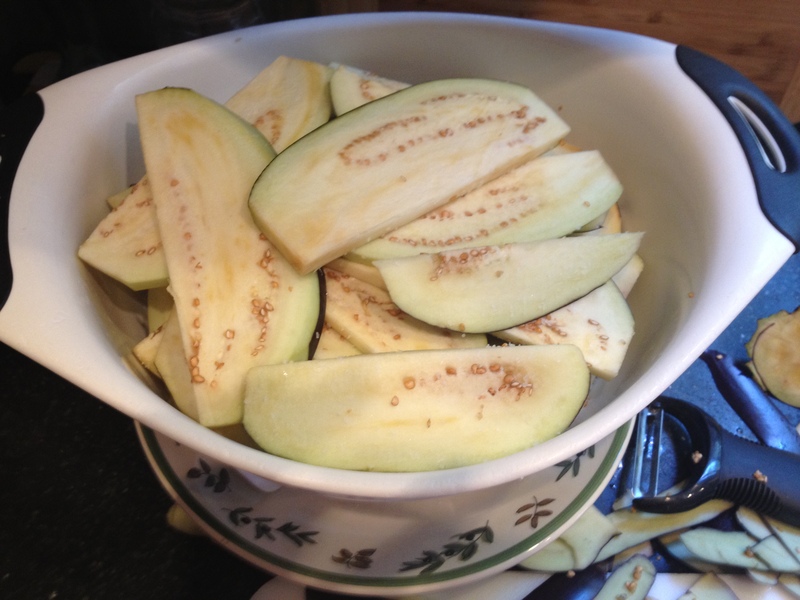 Repeat the steps ending with the layer of eggplants (TIP: change the direction of the eggplants for each layer. 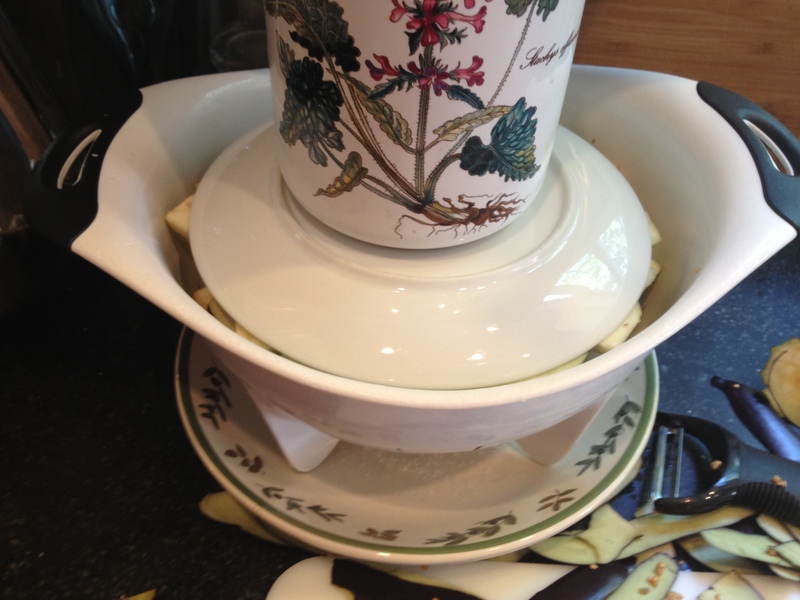 This will allow the Parmigiana to hold its shape once you cut and plate). 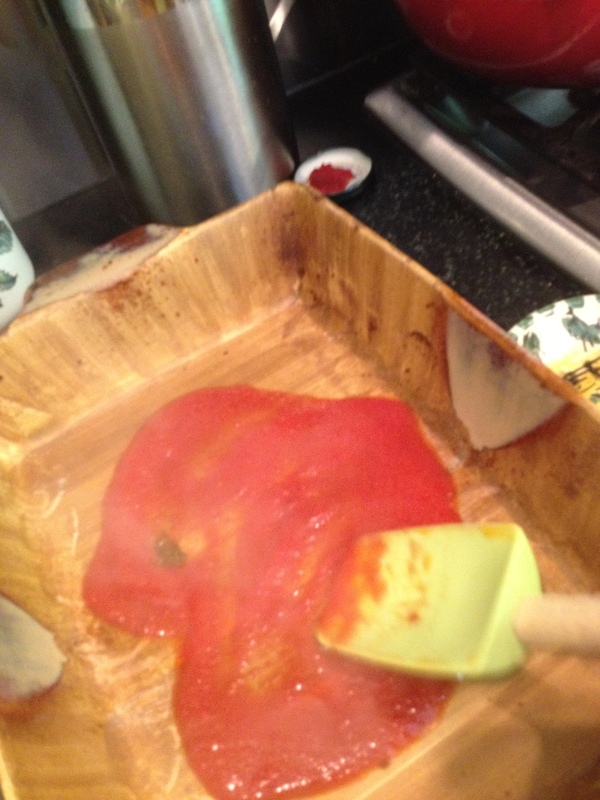 Cover the last layer with tomatoes sauce and sprinkle with Parmigiano cheese. Few fresh basil leaves will make it look pretty. Ready for the oven . . . Bake for 30 minutes. Oops, I forgot the timer and I left mine in a little longer, can you see the brown spots? 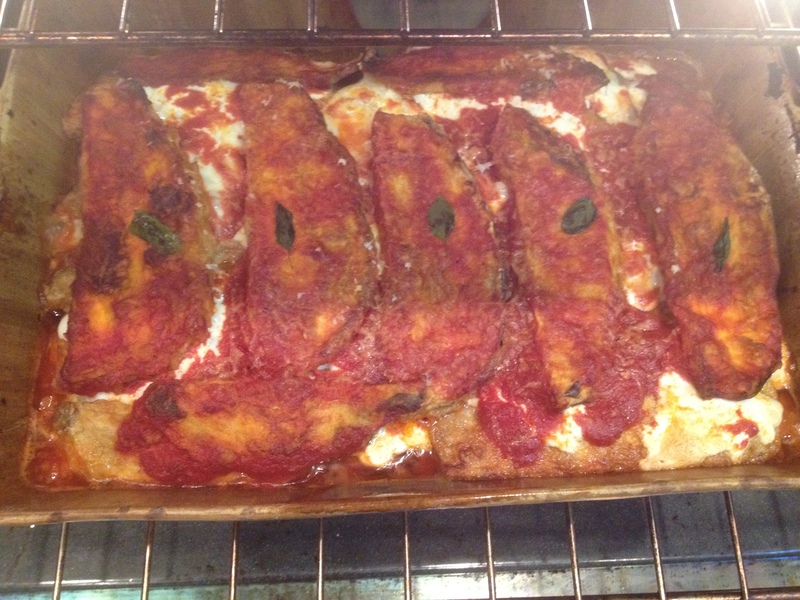 Turn the oven off and let the Parmigiana rest in the oven for at least 45 minutes. Remove form oven and let it rest for one additional hour. 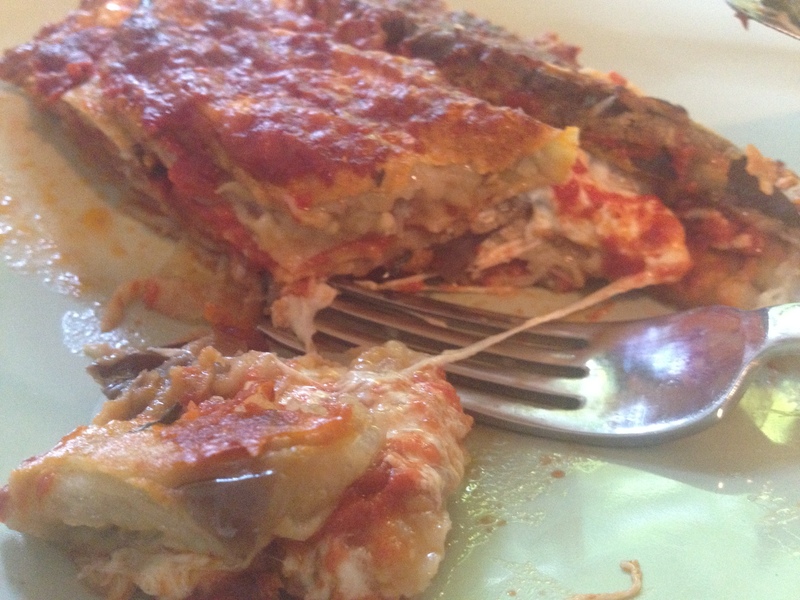 The Parmigiana is one of these dishes that develop its full flavor during resting time. 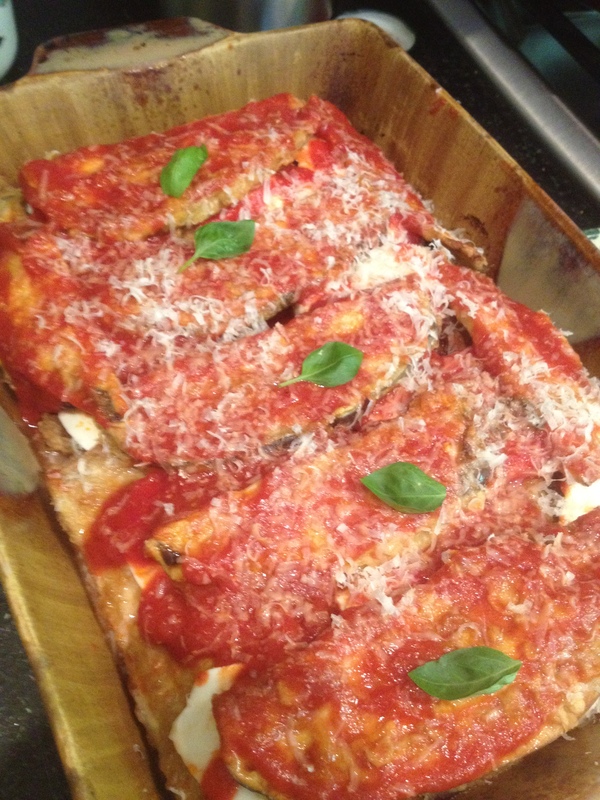 So plan in advance, your Parmigiana will be even better if you prepare it the night before.
. . . AND TASTING! 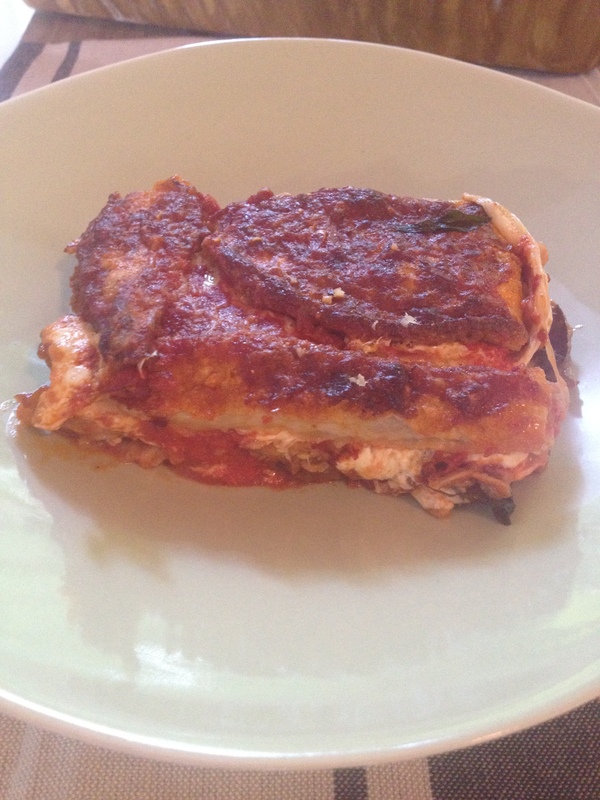 Despite the few missing slices and the little overcooked top, my Parmigiana was buonissima! As you can see, not much leftover! One last thing . . . Please, don’t serve the Parmigiana on top of spaghetti! Note: Also try the less traditional Parmigiana di Zucchini. 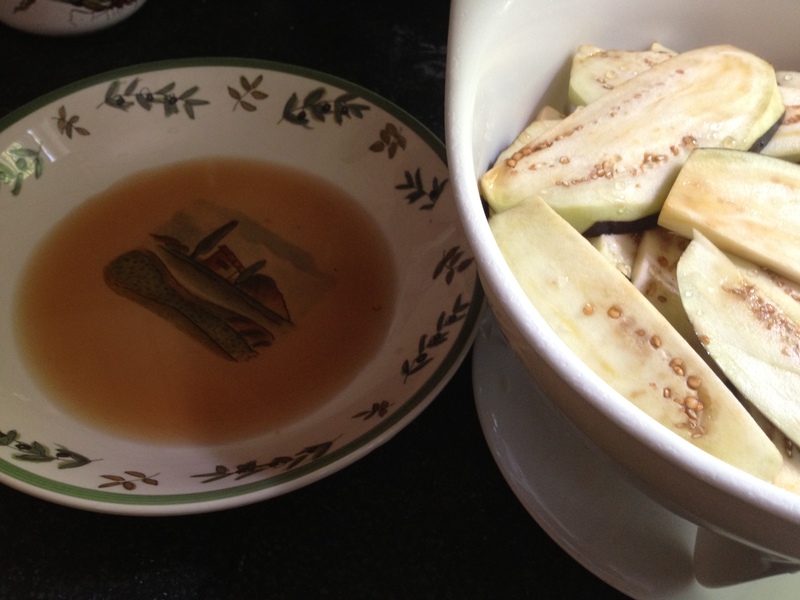 The procedure to follow is the same, but the zucchini do not need to drain under salt. Oh, I LOVE this! My mouth is watering too. I love all things eggplant. Are your measurements American or European? American measurements. I am glad you found me too…welcome to my blog! I’m making this on Sunday for sure. Wegmans has the baby eggplant, no? Ciao! Looks fantastic and I love aubergines. if only I wasn’t so lazy! Have a great hol. Thank you for your comment. As I said your time in the kitchen will be rewarded with a dish that might become your favorite . . . Give it a try! OMG!! I can smell it all right…I think I just licked my computer screen in a total delirious state of food nirvana!! LOL! This looks AMAZING! Thanks so much for sharing it with us. This was one of my Nana’s specialties, too, and one of my all time favorites. Thank you so much for sharing your mother’s recipe and for including all of those wonderful and helpful pictures, MariaGiovanna! Thank you Robin! I am curious, was your Nana’s recipe different? Isn’t what is all about? Family, memories and to pass them on! My son had it for breakfast too :-)!